Heat a wok or skillet over high heat and add the peanut oil. Add the peppercorns and stir-fry until fragrant and mix in the preserved vegetables. Stir-fry the mixture for about 15 seconds. Then add in the ground chicken and continue to fry until the chicken is cooked. Add the white pepper, soy sauce, and dark soy sauce. Stir-fry the meat mixture until browned and crisp. Remove from the heat and set aside. In a wok or saucepan over high heat, add peanut oil and mix in the peppercorns. Stir-fry until fragrant and add garlic, ginger, and scallions and stir-fry for about 30 to 40 seconds. Reduce the heat to low, mix in the soy sauce, dark soy sauce, chili oil, and sesame paste and simmer for about 2 to 3 minutes. 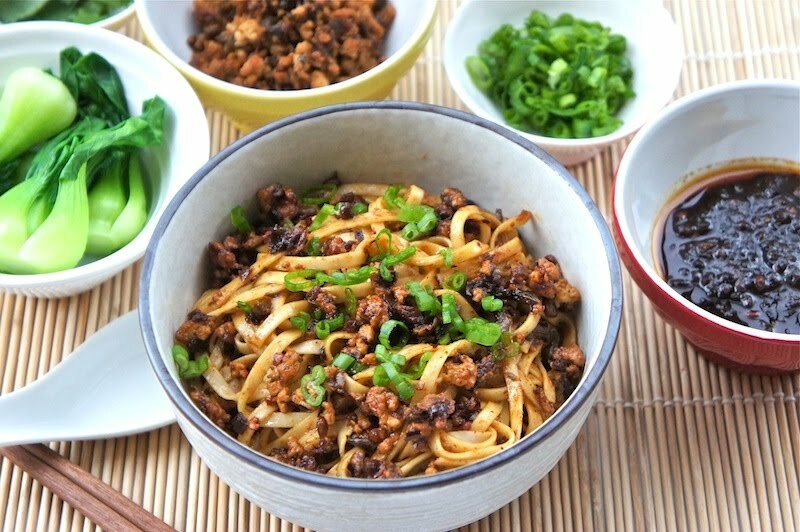 To serve the noodle: Divide the noodles among 4 to 6 bowls, add the sauce, meat mixture and mix together. Top with vegetables, chopped scallions, or coriander, Chinese celery and serve immediately. This looks so appetizing, especially the first photo! this looks divine! noodles of all kind are my fav! thanks for sharing angie! This looks so delicious. your photo looks so appetizing. Yum yum yum! Wish I had all the ingredients to make that for dinner. Looks so amazingly good. @The Chef In My Head: Enjoy! Btw, nice avatar (logo). I am confused, for the ingredients for the sauce no peppercorns are mentioned, but your instructions require peppercorns to be added to the oil when you make the sauce, as well when you brown the vegetables and meat. Could you clarify please? The recipe sounds marvelous and I don't want to mess it up. @Marlis: Oops! I missed out the Sichuan peppercorn. Thanks. MMM...I'm in love with the dan-dan noodles at Myers and Chang and it sounds like this is pretty similar based on the ingredients. 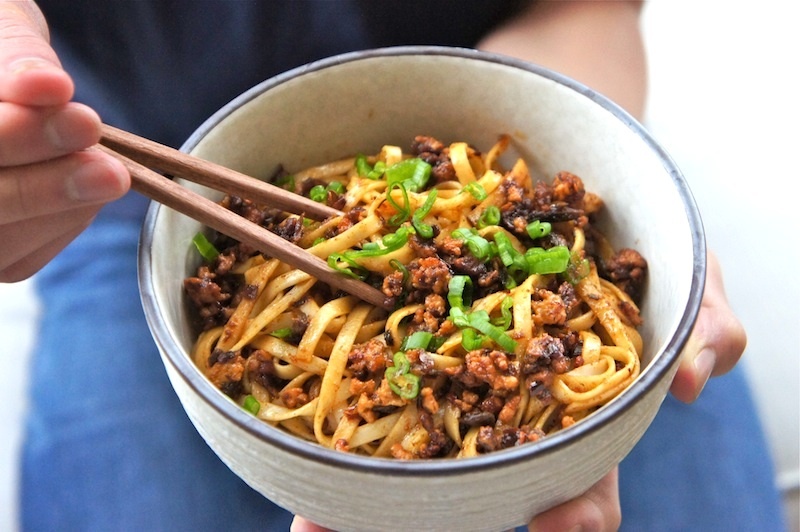 I'm going to file this recipe for the next time I'm craving some asian noodles! Love Dan Dan Noodles! Nothing like having spicy noodles on a cold day! Will be sharing this on my site!! I've never had this dish, but it sounds absolutely delicious! That dan dan mien looks really tasty! I've been following your food blog for quite a while and tried some of your recipes. They taste good all thanks to simple and clear instructions. However, there are some ingredients that I'm not familiar. For example, sesame paste. Instead of getting a jar from Asian groceries store, is it possible for me to do it myself or substitute it with some other ingredient? Thanks for your comments and support. There's no substitute for the sesame paste in this recipe. The paste came in a small jar, and inexpensive too. Hi! I love you recipe and video! Could I ask what brand of wok/skillet you used in this video? Thanks! This is a Hawkins Futura® Kadhai Deep Fry Pan, with 14"/36cm with 7.5 Liter capacity. Angie i bought dried lanzhou pulled noodles from the chinese grocery store.The package instructions said to boil them for 3 minutes.I did that but the noodles were gummy and starchy..is there any tips you can give to keep the noodles elastic? 1. try add some salt and extra water to boil the noodles. 2. rinse the noodles with cold water and drain well.